In this channel episode Anders will show you how to ramp up to working on barre chords to make them easier to learn. 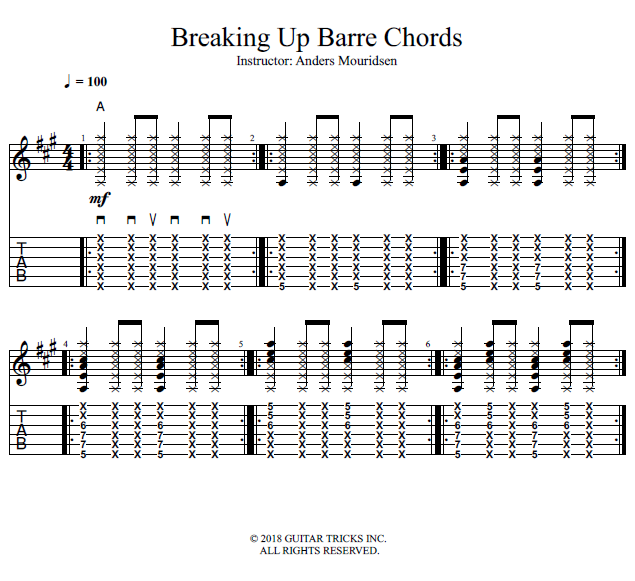 If you are just learning barre chords this exercise is a great way to break up a full barre chord into smaller sections in order to practice getting used to them. At first just start with the bass note. Then add a few more strings as you get it to work. Try the same approach from the treble register and just play the high strings! Then gradually add the other strings. This is a great way for beginners to ramp up to learning to play barre chords. If you like this lesson, then the GT Fundamentals Course covers barre chords. Also the Rock course has a lot of material on using barre chords in various ways!